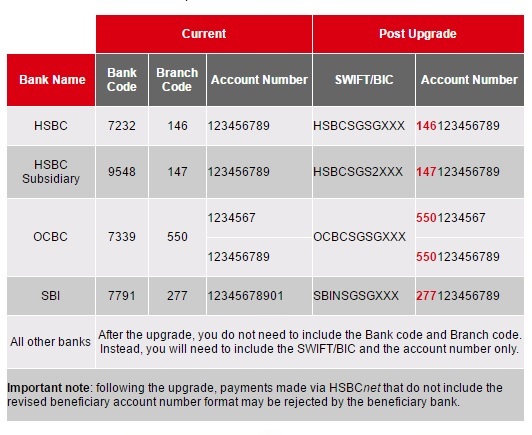 HSBC bank has introduced the SWIFT/BIC to replace the need to input bank and branch codes. a valid Payment Purpose code. Please note, as of 1 October, HUB MRI and Singapore MRI file formats will no longer be supported by HSBCnet. If you are currently using these formats for File Upload, you must implement one of the supported file formats indicated in the HSBC Singapore GIRO (ACH) Payment Formatting Guide. For more information, please click here or contact your HSBC account manager.